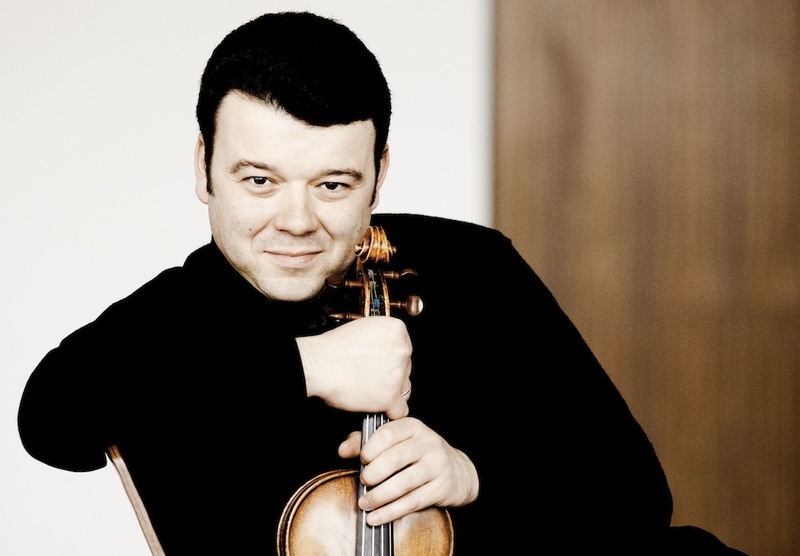 On February 4 at Carnegie Hall, the famously conductorless Orpheus Chamber Orchestra presented a performance of Tchaikovsky's beloved Violin Concerto with a twist: the soloist Vadim Gluzman played the piece on the actual instrument that inspired the composer to write the piece. The violin in question was owned at the time by Leopold Auer, who was the concertmaster of the Bolshoi Theatre in Moscow. Tchaikovsky wrote the piece for Auer to premiere, but the violinst, according to legend, declared the difficult work to be unplayable, and though he eventually warmed to it, Tchaikovsky didn't live to hear him perform it. Gluzman, the current proprietor of the very same 1690 Stradivarius, can no doubt give a spectacular rendition of the piece on any instrument, but these special circumstances turned this performance into something resembling a holy ritual. The audience was rapt as Gluzman drew dark, rich, opulent sound out of the violin, playing with pure, sweet intonation and no-nonsense phrasing. He let the piece speak for itself, which it did gloriously, and every note of the blisteringly fast runs rang out sonorously. His playing seemed almost frictionless, with no harsh attacks and nearly imperceptible bow changes. Gluzman gave a refreshingly unsyrupy rendering of the second movement's gorgeous, singing melody. Even when he stretched the phrases slightly it didn't seem indulgent. Somehow the orchestra stayed with him in his bat-out-of-hell approach to the last movement, whose main theme seemed faster every time it reappeared. The call and response woodwind figures in the lyrical interludes were particularly well-shaped, and the headlong lunge to the end was electrifying. The amazing precision of ensemble that Orpheus displays without benefit of a conductor remains a marvel. The orchestra opened the program with Mendelssohn's Symphony No. 3 in A minor ("Scottish"), and the level of personal commitment from the players was immediately obvious. With nobody on the podium waving a stick, each orchestra member is more deeply involved, both musically and physically. Although this symphony is not one of the more overtly thrilling items in the repertoire, the players treated the musical materials reverentially, with the kind of subtle shadings and shaping one associates with a charismatic conductor. The transitions between sections of different tempos were done seamlessly, and the rhythmically vigorous passages came off with fireworks and verve. The concertmaster (it was a different player for each piece) clearly played a leadership role, but there was no obvious bobbing up and down to provide the beat--it was thoroughly a group endeavor. The technically challenging second movement featured snappy dotted rhythms and ended with remarkably synchronous string pizzicato. The ensemble's warmly integrated string tone was especially apparent in the noble, regal third movement; the players made serene poetry out of the long lyrical lines of the opening theme. In the exciting last movement vivace, the ensemble did subtle bends of tempo and shifts of dynamics as a near perfect unit. It was a model of virtuosity, cooperation, and commitment. Preceeding the Tchaikovsky concerto on the second half was Michael Hersch's twenty-minute, eight-movement work end stages, an Orpheus commission and New York City premiere. Like his recent chamber opera On the Threshold of Winter, which Hersch described as a sister piece, end stages is about confronting terminal cancer. The first section opens with glassy sounding string effects, woodwind shrieks, and an unsettling low-register bassoon crescendo. Astringent harmonies and alternating gestures of pain and placidity contribute to the depiction of a world in turmoil. In the fourth movement, the woodwinds attempt a relatively normal sounding chorale melody, but the other instruments interrupt and then take over completely. Hersch has a formidable arsenal of modernist devices at his disposal, but it's not just a bag of tricks; he's expressing something profound and deeply personal with his inventive sonorities, textures, and emphatic gestures. As he put it in brief spoken remarks before the performance, there is a lot of friction between writing something that is completely private but that gets communicated to other human beings. This piece is not exactly a crowd-pleaser, but the audience could tell it took a lot of guts to write and they responded appreciatively to the authenticity. Orpheus Chamber Orchestra in concert at Carnegie Hall on February 4, 2017. Vadim Gluzman, violin. Joshua Rosenblum, a Contributing Writer for ZEALnyc, writes on classical music performance, theater, and related topics.